View our current line of high quality agricultural and industrial equipment. A.I.M. 's modern facilities provide full capabilities for precision machining and fabrication. Detailed information about Plant Design will be found here very soon. American International Manufacturing (AIM) is a uniquely qualified manufacturing company fabricating high quality agricultural and industrial equipment at its modern 23,000 sq. 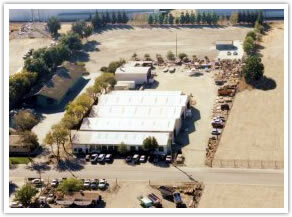 ft. facility in Woodland, California. AIM is uniquely qualified because of its full line of capabilities featuring a well-equipped machine shop and metal fabricating facility. AIM also has a design division that utilizes the latest AutoCad and SolidWorks design software. Our fabrication process incorporates old world craftsmanship with up to date CNC technology. This gives AIM a long standing reputation of equipment on the cutting edge with a personal touch. Since its establishment in 1973, AIM has specialized in fabricating the highest quality equipment, customized to meet your needs. Our goal is to work hand in hand with you to deliver equipment that works as hard as you do. Since the inception of AIM, we have grown from our simple airleg, an industry work horse, to include a variety of products. These products have been utilized internationally in many countries such as Mexico, Egypt, Canada, France, England, Saudi Arabia and Kuwait. Domestically, our equipment serves such customers as California Almond Growers, General Mills, Quaker Oats, Mariani Nut Co., Diamond Walnut, Bolthouse Farms, etc. Our machine shop is equipped to provide precision machining for those One-of-a-Kind projects or production quantities. AIM prides itself on those repair projects that need that extra care. Our machinists work with mild steel and stainless steel. In addition, AIM also works projects that require special alloy steel, brass, aluminum, or plastics. Our fabrication shop provides standard mild steel and stainless steel fabrication to meet your specific needs. In addition, we provide sanitary food grade construction for projects with those requirements. Take a look inside and see what we can do for you! Products: “A.I.M.” Pneumatic Separator, Conveyors, Screeners, Sizers and Air Handling Equipment (ducts, elbows, fitting and cyclones), and Bean Polishers. Other Capabilities: Precision Machining and Fabrication from One-of-a-Kind to Production Quantities, Sanitary Food Grade Construction, Working with Mild Steel, Hi Carbon, Alloys, Stainless, Brass, Aluminum, Plastic and Epoxy.